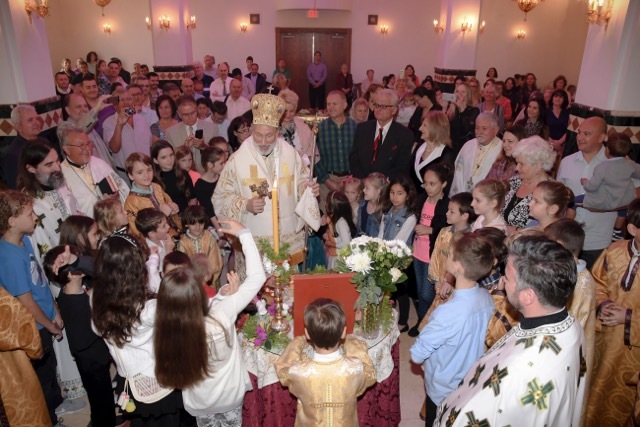 It was a wonderful day to celebrate St. Sava Day at our church St. George in Clearwater, Florida (Sunday February 5, 2017). We were blessed with our first visit of our new Eastern Diocese Bishop, His Grace Bishop Irinej. The Divine Liturgy was beautiful. The community enjoyed how eloquently His Grace spoke in both Serbian and English. A highlight of the day was when His Grace spoke with our children, asking them questions about St. Sava, after the Slava Kolac and Zito were blessed. The children did so well it put smiles on everyone's face, especially His Grace Bishop Irinej. After the liturgy everyone went to the building site of the new parish home which was blessed by His Grace. After the blessing of the parish home a delicious lunch was served by our Kolo sisters. A wonderful children's program followed. Serving in the altar with His Grace Bishop Irinej was Prota Jovan Todorovic, Prota Milan Stojanovic, Prota Dragan Zaric, Rev. Aleksandar Petrovic from Chicago and Deacon Panayoti Panayotis from Naples. Kumovi of this year’s St. Sava Slava were Sveta and Gordona Jocic; accepting to be Kumovi for slava next year were Ljupco and Duska Ivanov.